Having the right seat is a combination of comfort and safety. It is important to get a seat that fits snugly, but not tightly around the driver's hips. The height of the back should extend up to the driver's shoulders, but not so high that it touches the driver's neck brace. If the back of the seat pushes on the driver's neck brace or helmet, it can be very uncomfortable and even unsafe. After selecting the seat, get ready to mount it to the chassis. 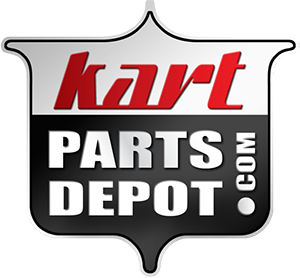 Place the chassis on a flat surface or on your kart stand. Your goal is to mount the bottom of the seat level with the bottom of the chassis rails. If it is any lower, it could become damaged by the items on the road. Use a board between the kart frame and the stand or trolley to position the seat. Put the seat on the board and place a heavy object in the seat so that it sits flat. The front edge measurement is taken from between the furthes forward edge of the seat and the front chassis tube which is where the driver's heel would rest. This dimension will vary according to the seat shape and size though it should be approximately 61- 62 cm. Measuring perpendicular from the spine on the back of the seat to the middle of the rear axle, the distance should be 17 cm. The seat should sit in the middle of the seat supports. Once the seat is in position, it is time to start marking holes. Before marking the holes, bend the tabs of the seat stays so that the flat of the stays are parallel to the sides of seat. Place nylon seat washers on the stays and then mark the mounting points on the seat. Drill the 4 holes in the front and mount the seat. Again, bend the tabs of the rear seat stays, place the nylon washers on the stays, and mark the holes. Drill the holes and insert the bolts. It is vital that the bolts slide cleanly straight through the seat and the stays without any pressure or twisting on the seat. If it takes pressure to correct the alignment of the bolt holes in the seat and the holes in the stays, you need to restart the alignment and drilling process. Misalignment pressure on the seat, can cause it to crack during the rigors of racing.